I recently received a printout of a family tree from a family member that shows direct lineage through our Russell line to the major royalty of Europe. After reviewing the tree for a few seconds I pronounced it completely fictitious. My family member who presented me with this printout said it was correct because the woman who had done it was married to a pilot. Now that is all the confirmation I needed. I only had to go back three generations from the compiler of the family tree to begin finding mistakes. She had listed the wrong name for our great grandmother, whom I assume (yes, I know what that means) she had met since she and I are the same age and grew up in the same area of Arkansas. As I go back a few more generations I find many more glaring mistakes with direct ancestor’s names and other information until I get back to our 5x great grandfather, John Russell (1766-1839). From there the leap in the family tree becomes a practice of extraordinary quantum physics as John Russell, in this family tree, was born in 1766 in South Carolina and died in 1839 in Georgia. 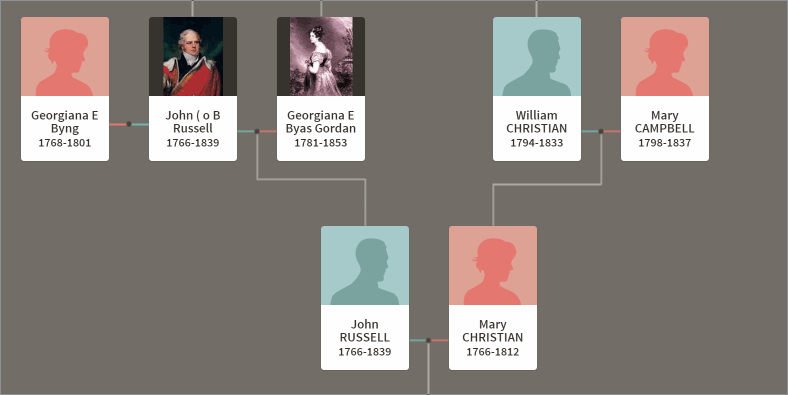 This John Russell, born in South Carolina in 1766, is the son, according to this family tree, of Lord John Russell, 6th Duke of Bedford, born 1766 in Liverpool, Lancashire, England, and died in 1839 in Lancashire, England. So father and son were born the same year, died the same year, and neither mother nor father ever set foot in the continent the son was born. To top it off, his mother was born in 1768 when he was already two years old. I look over at the American John Russell’s wife, Mary Christian, and see that she was born in 1766 in South Carolina and died in 1812 in Georgia. Her parents, according to this online family tree, were William Christian, born in Tennessee in 1794, and Mary Campbell, born in 1798 in Scotland. They were married in Tennessee in 1815. Now let me get this right, the parents of Mary Christian were born when she was 32 years of age. Not only that, but they were not even married until she had been dead for three years. The above example is why we, as genealogists, whether professional or hobbyist, must follow the Genealogical Proof Standard (GPS). Not only will GPS guide you to your location when driving, it also guides you in your research. Provides a soundly reasoned, coherently written conclusion. The person documenting the obvious errors overlooked glaring facts, such as son and father being born the same year, son being born two years before mother, parents never even being in the continent the son was in, and wife being 32 years old when her parents were born. Her only source for each of these individuals was other Ancestry Family Trees. If folks performing genealogical research would simply follow these Standards not only will they have much more accurate information to pass on to their family members, they would not need a “married to a pilot” qualifier for their work. Their work would stand on its own.